In the third poor economic report today, we learned industrial production declined 0.4% vs. an Econoday Consensus of -0.2%. Diving into the Industrial Production and Capacity Utilization – G.17 Federal Reserve Report we also learned July was revised from +0.7 to +0.6 and manufacturing from +0.5 to +0.4%. The standout pair of numbers is industrial production at -0.4% vs. motor vehicle production at +0.5%. There was some life in the factory sector during July but it proved brief, at least for production. Held down by a 0.4 percent decline in the manufacturing component, industrial production also fell 0.4 percent in data for August. But motor vehicles continue to be a plus in the report, rising 0.5 percent and offsetting a 0.5 percent decline in hi-tech production. And mining is an increasing plus in the report, emerging from deep weakness with a second straight gain and a solid one at plus 1.0 percent. Utility production, which had up in prior months, fell back 1.4 percent in August. Total capacity utilization edged 4 tenths lower to 75.5 percent. This report isn’t as weak as the headline readings suggest but, given weakness in other data including this morning’s Philly Fed and Empire State reports, won’t build much confidence that the factory sector will contribute much to the nation’s third-quarter growth. Industrial production showed solid life in both June and July with respective gains of 0.4 and 0.7 percent and including gains for manufacturing production of 0.3 and 0.5 percent. The latter included strong gains for vehicle production and hi-tech production along with promising gains for business equipment. Broad strength in the July durable goods report should support further improvement. Apart from manufacturing, utility output has been strong with mining beginning to trend higher. Capacity utilization, at 75.9 percent in July, has also been on the rise. Say what? How could it be worse? Motor vehicles sales are sinking while production is up. And despite a huge increase in motor vehicle sales factory production sank big. On September 1, I reported Ford Announces “Sales Plateau” After 8% Decline, Missing Estimates; Diving Further Into the ISM “Anomaly”. 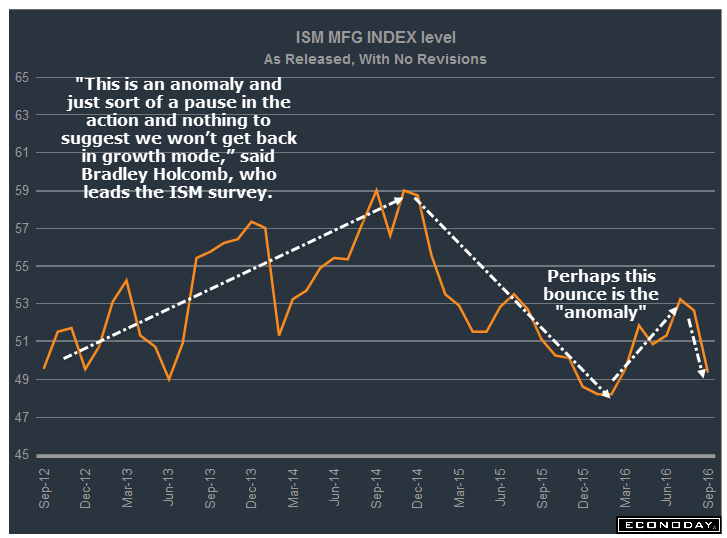 Earlier today I noted ISM Dips Into Negative Territory; It’s “An Anomaly, Just a Pause”. Today, I am pleased to report that Pater and I launched a new service, free of charge of course: It’s called “Anomaly Spotters Anonymous”. We are both expecting more “anomalies”. Stay tuned. Today our vigilant spotters did indeed spot more “anomalies”. Production of autos rising vs. declines in sales is the biggest anomaly we have spotted since the announcement. I expect this anomaly to resolve in falling prices as well as lower production in the months ahead. Stay tuned. We are confident this anomaly will be superseded by even bigger anomalies in the coming weeks.